NGCoded has the highest performance, lowest latency, best visual quality video encoders available and is demonstrating the future of live video streams and mixed reality experiences at CES 2019. If you would like to meet with us, use our online scheduling tool at www.ngcodec.com/ces online or visit our booth at Sands Expo Center,Level 1, Hall G, Booth 52786 at CES 2019. Video streams are a massive component - 70% - of internet traffic and growing fast. At CES 2019 NGCodec will for the first time have our own booth and will be demonstrating the future of live, interactive internet video. We are announcing our upcoming AV1 support and double density encoding - a 2X performance improvement - coming later this year. We are also demonstrating VR encoding for real time, interactive games at the full resolution and spec of the HTC Vive featuring our latest latency improvements, delivering an ultra low latency video stream with performance and visual quality indistinguishable from the native stream at less than 20Mbits/second. 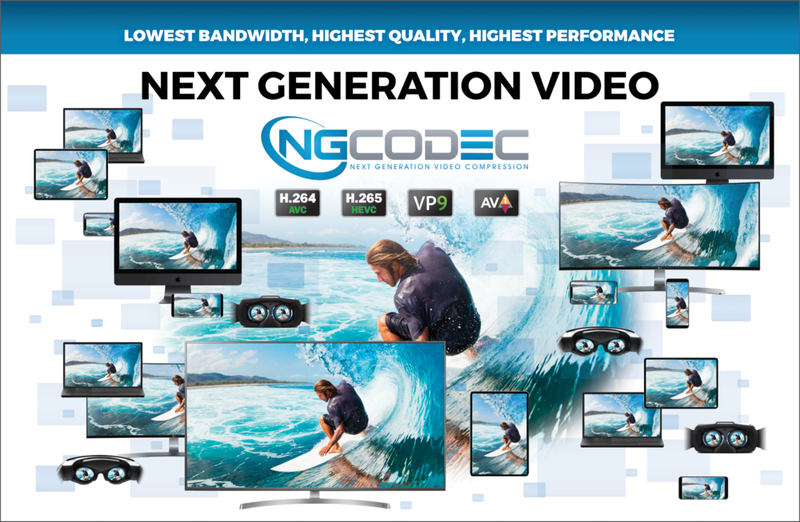 Today, NGCodec has the highest performance video encoder available and the only encoders which can provide broadcast quality live streams on H.265/HEVC and VP9. It produces encoded video at the highest quality and lowest bitrate employing the latest video standards. At CES 2019 you can see our new NGCodec developer platform, a small dedicated video encoder for prototyping cloud-scale encoding. Emerging codecs including H.265/HEVC and VP9 offer higher compression rates with the same or better visual quality and encoding costs. Implementations vary – the compression rate and visual quality of a given encoder can be dramatically different. NGCodec has developed state-of-the-art encoders, using Xilinx FPGAs, providing over 30% better compression with H.265/HEVC and VP9 compared to existing H.264/AVC encoders targeting live workloads. For video streaming, better compression means reduction in bandwidth. Google, Twitch, and NGCodec recently published a VP9 implementation white paper on hardware based encoding for live VP9 encoding and Twitch has created a pubic test stream as a technology demonstration. You need VP9 decoder support in your browser which is available with Chrome and can be viewed at https://www.twitch.tv/vp9dev online. In the future, improving performance in video encoding makes it possible to deliver broadcast quality interactive experiences at modest bitrates to all consumers on all devices. Emerging services will stream experiences from the cloud and cloud edge - virtual reality, augmented reality, and interactive video - with low latency indistinguishable from a local PC. On emerging 5G networks, users can experience the performance of a high performance computer on lightweight VR and AR glasses with applications processed and encoded to video with low latency in the cloud. NGCodec is working with Ericsson and other industry leaders to demonstrate VR over 5G. In 2018 we provide the first demo of interactive VR on a live 5G network at the Ericsson Silicon Valley Experience Center, encoding video to H.265/HEVC at less than 20Mbits/second using the HTC Vive at full resolution and framerate spec with no perceived latency when compared to use on a desktop PC. For more information feel free to reach out to info@ngcodec.com or feel free to book some time with our online tool www.ngcodec.com/ces at CES 2019.